Located just a few stores down the block from the original Chinatown Joy Yee on Archer Avenue, Joy Yee Plus specializes in shabu-shabu hot pot. In recent years, it has also become the destination to experience the cutting edge of new dessert trends, focusing on bubble tea, Hong Kong-style bubble waffles, and ice cream. When you walk into the store, posters for the newest drinks are pasted on the walls and displayed on the counter. They are advertising a variety of drinks made with butterfly pea flower tea, which is a brilliant blue when brewed and can change hue with the addition of different ingredients. Alongside these rainbow drinks are advertisements for cheese tea, which includes a layer of either sweet or salty cream cheese foam on top of the drink. I ordered the sparkling mango-passion fruit butterfly pea flower tea and the House Matcha ice cream bubble waffle. My drink came in Joy Yee’s signature sealed plastic bottle; there was a layer of orange fruit flavor underneath the deep violet of the butterfly pea flower tea. I tasted both layers before mixing them, and the purple one was overpowered by the strong fruit flavor. I didn’t care much for that particular fruit combination, but I easily scarfed down the stunning waffle dessert—which admittedly might have warped my taste buds with the sweet mix of matcha-flavored soft serve, sweetened condensed milk, red bean, and mochi. My friends and I split the behemoth, and had to eat quickly since the waffle was still warm from being freshly made. Joy Yee Plus, 2159 S. China Pl. Monday–Friday, 2pm–11pm; Saturday, noon–midnight; Sunday, noon–11pm. (312) 842-8928. Perhaps to the chagrin of our many French-speaking readers, the popular pronunciation of Tous Les Jours is the Korean way: 뚜레쥬르 (ddu-le-joo-reuh). 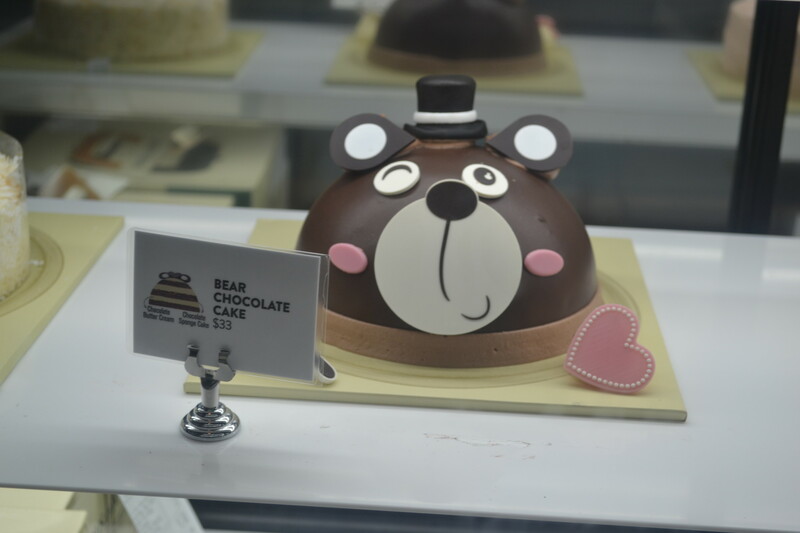 An “Asian-French” bakery founded in South Korea in 1996, Tous Les Jours serves as a marker for the presence of Korean communities wherever it’s found. In suburbs with a significant Korean population, Tous Les Jours is where mothers congregate after church over coffee and sweet bread filled with red bean paste; students split a loaf of mocha cream bread while studying; and a Korean father with the worst score in a round of golf pays for his friends’ pat-bing-su—a summer treat that layers sweet red bean paste and fruit over a mountain of shaved ice. While Tous Les Jours has four locations in Chicago suburbs—Naperville, Schaumburg, Glenview, and Vernon Hills—the newest iteration is in Chinatown, where it’s not marketed as explicitly Korean but blends in with the Pan-Asian array of restaurants in the neighborhood. The sign has changed with time—in the 2010s, it presented a dove hovering over flaming hammer-and-sickles; today, it has an image of a protest cross-dissolved into a blue sky. But it’s the numbers that really make you think. If the bookkeeping is to be believed, then an incredible percentage of the Chinese population has jumped ship: in February 2007, the number sat in the eighteen millions; as of July 2018, it’s passed thirty million. This count might be a little inflated. But with no contact information to speak of, the real question remains: who’s behind it? The Weekly has yet to meet whoever’s updating the sign on the first of every month. 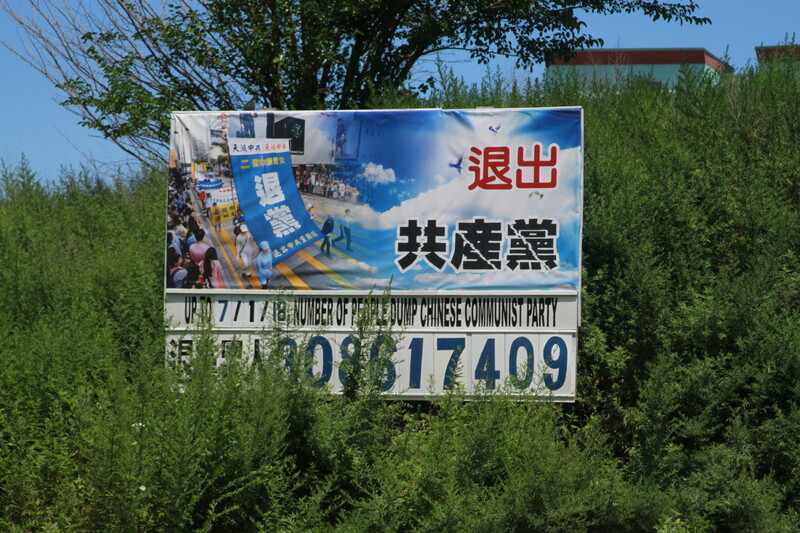 But the slogan—退出共产党 (Quit the Chinese Communist Party)—suggests a tie to Falun Gong (or Falun Dafa), a meditative practice persecuted by the Chinese Communist Party, and “退党 (Quit Party),” a dissident movement driven by Falun Gong groups. The Chinese Communist Party, the ruling party of the People’s Republic of China, has attempted to eradicate Falun Gong since the nineties, when the spirituality was first publicly taught. In years since, the state has referred to it as a “malicious cult” and tortured and “re-educated“ its observers. Several international human rights groups believe that practitioners have been killed to support China’s organ transplant industry. I am perched on the lowest rung of a giant pile of leather-stuffed cushions as I write, looking at a selection of books. The concentric pile of circular cushions—red, pink and orange, all of them stacked one on top of the other—resemble a birthday cake. A girl just screamed and ran past me. “This is unusual for the library,” I hear the librarian confess, “there are usually like two or three kids here on weekdays.” But today’s a Saturday, and the leftmost corner on the ground floor of the Chicago Public Library in Chinatown is bustling with humans of all ages. Located on the corner of Archer and Wentworth Avenue, the library moved to its new location hoping to bridge the old (southern) and new (northern) parts of the neighborhood. Mimicking the triangle formed by South Archer Avenue, West Cermak Road and South Wentworth Avenue , the structure of this modern library stands out from its counterparts in the city. From Lemony Snicket’s A Series of Unfortunate Events to Chinese books about shapes, the library has a volume for a child of any age. In fact, by the librarian’s desk there is a little brochure with titles in case you need a guide to help you pick out books for your child. Some of the other books I spotted included Cornelia Funke’s Inkheart trilogy, Carolyn Keene’s Nancy Drew series, as well as a handful of Judy Blume books. For the more inquisitive reader, there are beautifully illustrated books on the science behind snowflakes, fun facts about the cat family, and an encyclopedic series on the different states across the US. From precious jade objects found during the Shang Dynasty to metal objects from the Han Dynasty (some of which were buried with their owners), the Heritage Museum of Asian Art offers a glimpse into ancient Asian history from its new location in Chinatown. Reopened at the beginning of this year on West 26th Street, the museum is a red-brick building with banners detailing exhibitions hanging down the top-half of the facade. The street level entrance greets you with two stone luduans, Chinese mythical creatures, perched on pedestals. Previously located on 23rd Street, the new space is much larger, spread out across three floors, a blend between a private home and an antique store. Jeffrey Moy is the founder of the museum, as well as the owner of several of the pieces in the space. 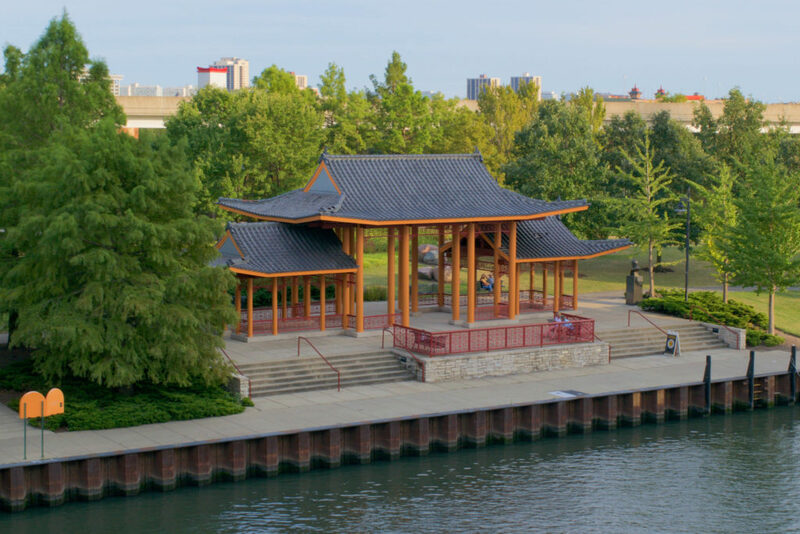 He’s third generation Chinese-American; his grandparents were among the founders of the original Chinatown in Chicago on Clark and Van Buren. George Theen, who is usually seated at the information desk, explained to me that in addition to their mission—“preserve and promote the tradition of Asian art for present and future generations”—the space is a way for Moy, also the museum director, to give back to the community. “A lot of the local people are not very familiar with this [history] and it’s their own heritage,” Theen added.